Iritatingly, a dog has bitten a hole in one of my rear panniers. I have had to fix it up with the last of my duct tape, but it won't be so watertight now. It could have been worse. The delightful hound could have bitten my leg. So. Now I feel I need a weapon against "man's best friend". But which? 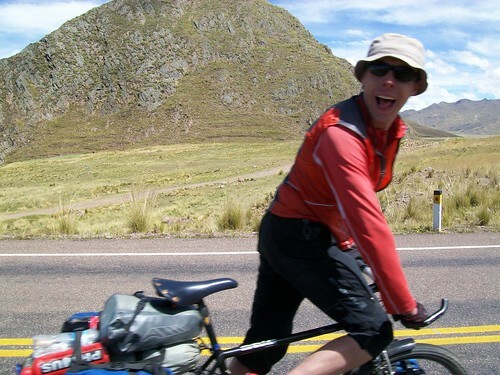 This has been a favourite topic amoung cyclists so here are the options I've heard. 1. Squirt dog with water from your water bottle. 3. Whip it with a horse whip or an old inner-tube. 4. Hit it with a machete (I know two cyclists who carry these). 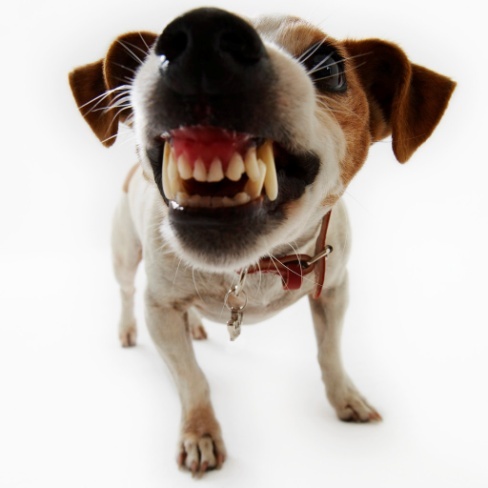 Perhaps more effective at getting the owner to control it, fearing the crazed gringo waving a machete around. 7. Zap it with a cattle-prod or a tazer. 8. Buy a Dog Dazer. A battery powered devise that emits a high-pitched sound that they don't like. 9. Throw rocks. I do this already. It's what the locals do so quite a good strategy. Sadly I don't have anywhere very good to store the stones and there isn't always time to pick some up. 10. Use physcology. Shout at it (suprisingly effective, especially if you use Spanish). For example "a tu casa!" Aim straight for it (dogs only attack from behind). Get off the bike (then it will recognise you as a human rather than a bike). 11. Ride the adrenaline rush and try and out run it. Not always possible. Do you know something that works better? 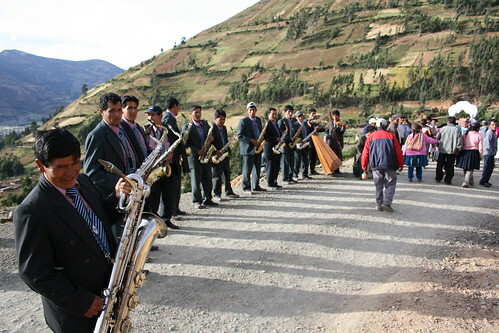 As I was cycling along I came across some saxophonists and a bunch of locals dancing. They blocked the whole road so I had to stop and watch (which I would have done anyway). In quick succession I was commanded to down 3 shots of goodness knows what. Luckily it was only a short downhill ride to the town. Made a quick recording. Here. Following from my Dylan Lyrics post here are some more song lyrics that are ringing true for me at the moment. I learned to play this on guitar once and never really paid attention to the lyrics. But aren't they lovely? There are two very popular ways to get to MP. 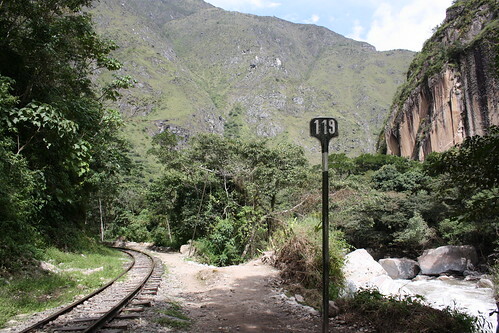 On the train and on the Inca Trail. Both are obscenely expensive. However, there is also a third way. Suitable for those with a taste for adventure, a tight budget or a penchant for the weird and akward. 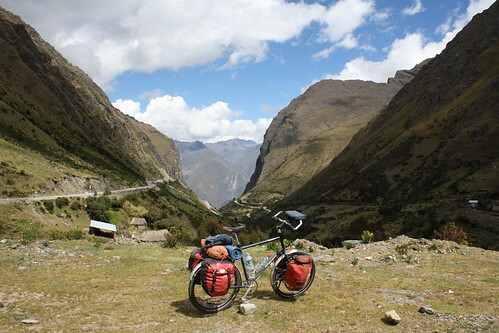 I began with a scenic cycle tour of the sacred valley with Mike. 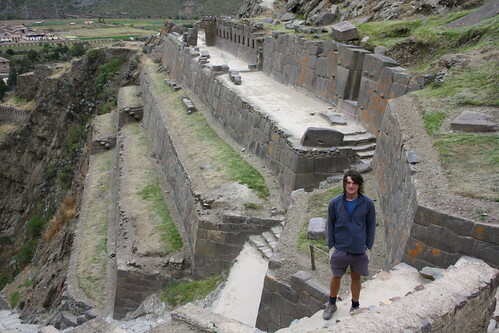 We whizzed by the various fortresses on the outskirts of Cusco and arrived for lunch in Pisac. In the afternoon we hiked up to see the terrific hilltop forts there. 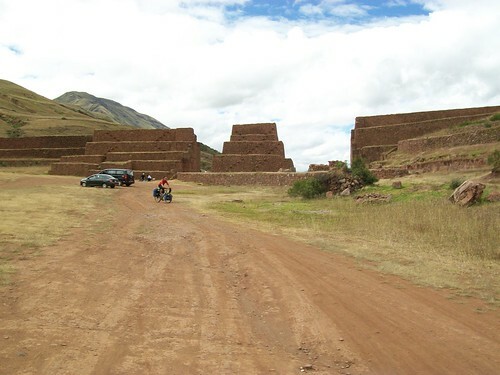 The next day we cycled to Ollataytambo where there are some more Inca Ruins. From here Mike headed back to Cusco and I headed on alone up to Abra Malaga, a 4316m pass. The views were amazing on the way up but then I hit a band of fog that sat on the hill. 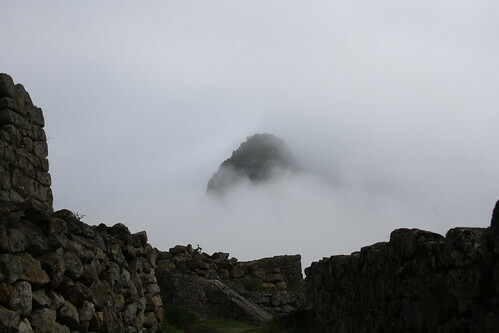 Soon after beginning my decsent down the otherside the stunning scenery reappeared. At dusk I arrived in Santa Maria, a small dusty town, and started looking for somewhere to stay. But before I could find my bearings, a lady swept me and my bike up onto a minivan to Santa Teresa. There I found a hostal without electricity and went to bed with a candle. 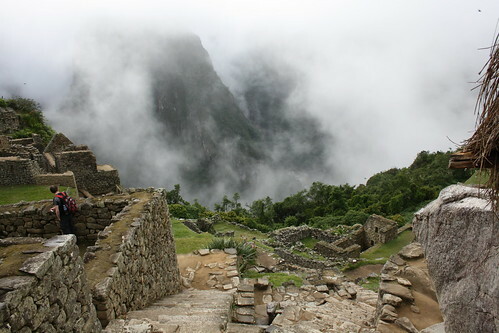 Machu Picchu has to be seen to be believed. The best way to see the sights of a city centre is undoubtably on foot. But how to start? In my book it's a good idea to hit the ground running. In several cities I have headed off in the morning for a jog around the main tourist sights. It has to be the best way to get an overview of the character of a town. 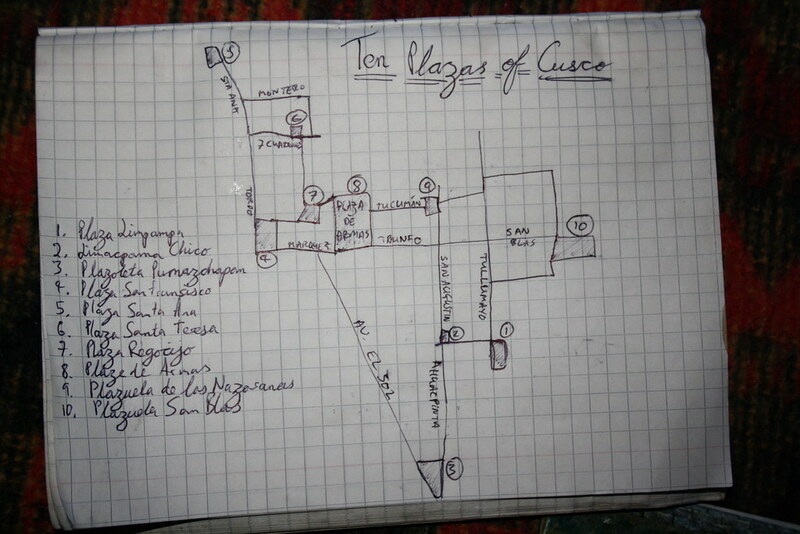 In Cusco I decided to plot a route that took in 10 plazas. Each one joined together by picturesque cobble streets, flights of steps or narrow alleys. Running up the flight of steps to Santa Ana left my bent double gasping for breath. Running back down required care as many of the ancient cobble stones have been worn to a polish by countless thousands of feet. Here's the route. Among the cultural differences of different countries, one of the first to be investigated is the beer. Bottoms up! A good country for beer and barbeques. The most popular beer in Argentina. Named after some ruins that Russ and I decided not to bother with as we were having a mare on a ripio road into a headwind. Reasonable enough lager. Coming across a shack of a farmstead, a beaten up Quilmes sign outside caught our attention. Soon we were offered a place to camp and homemade food and a trusty bottle of lager. An alternative lager. Similar to Quilmes in many respects. Slight improvement on Quilmes and Salta. Bit stronger and crisper flavour. Five stars don't get given out lightly. It is a dark porter with a toasted malty taste. Is it a cliché to describe it as chocolatey? Nice to drink something a bit English in the midst of all these lagers. I got one in a weird little campsite beside the river on the way to El Chalten. The place was run by a gang of hippies, with spacey ambient music, wooden cutlery and purple swirls painted on the cafe walls. Spending the festive period in Patagonia necessitated drinking quite a bit of Chilean beer. So I have a fondness for it. 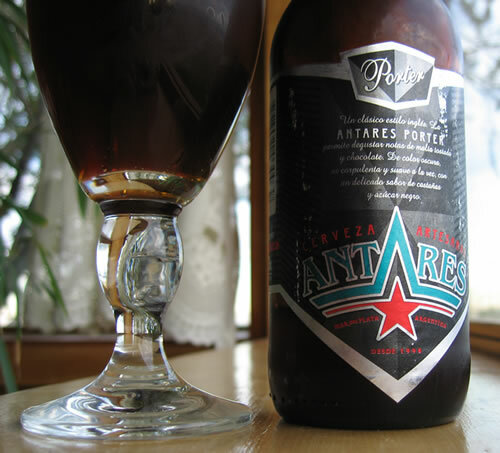 The most popular Chilean lager. Similar to Quilmes. Refreshing but weak beer. Has a weird golden brown colour and tastes slightly bitter and grainy. 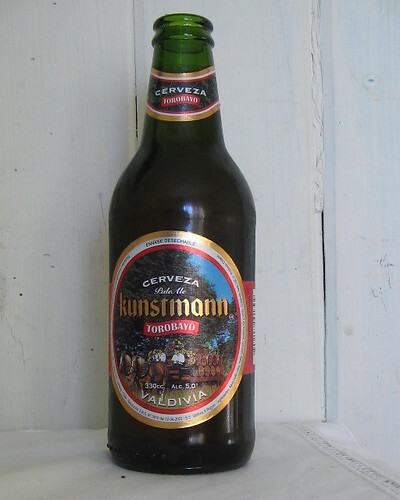 Example of the German influence on Chile and her beer selection. There are several types of these. I tried the bock and the lager. The bock was a nice caramel flavoured dark brown thing and the lager was just an average lager. Made in the most southerly brewery on the planet, this is a better than average lager. Probably due to using unpolluted polar water. Bit of a let down in terms of beer but this is of little consequence in such a spectacular country. Made up for the lack of quality with quantity. Fairly rough but drinkable. This is what you get more or less everywhere. Nice label. 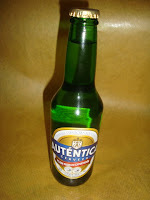 Maybe the best lager in Bolivia but that is hardly a compliment. In Potosí, where the brewery is, (no doubt the "highest brewery in the world") it comes out with an insane quantity of fizz. Made by Cervecería Boliviana Nacional, who also make Huari, this stuff is a tad better. It is supposed to be slightly more like a French lager but I didn't really get that. It is too early to tell (so wait for Part II). 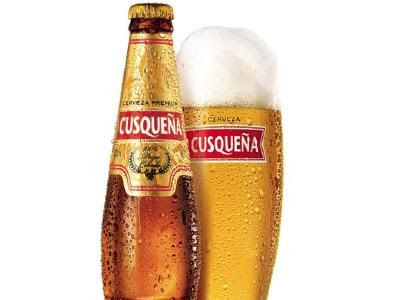 So far I have only tried Cusqueña (maybe ***) which I have nothing against. It is an inoffensive and middle-of-the-road beer. 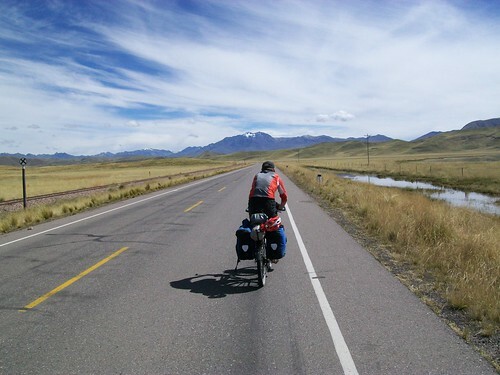 The sign read: CUSCO 244.60km. Such confidence to use two decimal places! I'd left Ayaviri and had put in sufficient distance to warrant a biscuit stop. Whilst I was sat leaning on a fencepost, munching away, swigging coke and reading, a cycle-tourer pulled up. 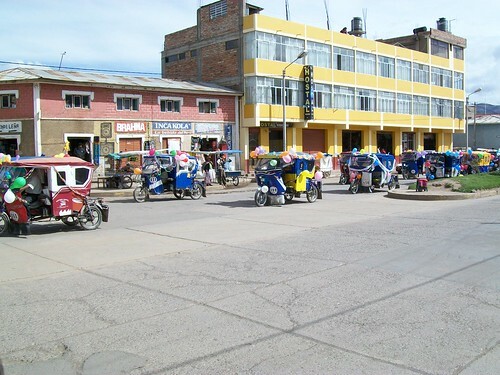 Mike started his trip down in Puerto Montt and will finish, albeit a little reluctantly, in Cusco. We pressed on together with mountainous scenery on the horizon looming ever closer. 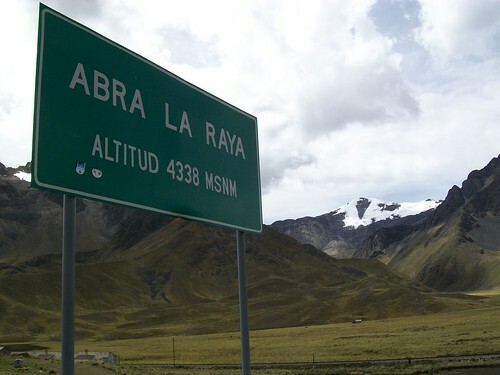 Gradually, the road climbed and, by lunchtime, we found ourselves at the top of Abra La Raya: a 4338m pass. Here you can purchase a great variety of tourist-tat, listen to poorly played flute or take photos of a lady in traditional costume with a vicuna in tow. A bus load of tourists were hoarded out for these purposes. As we lunched we were pestered by a maniacally grinning barefoot village idiot. We rolled down the other side into a superb valley. 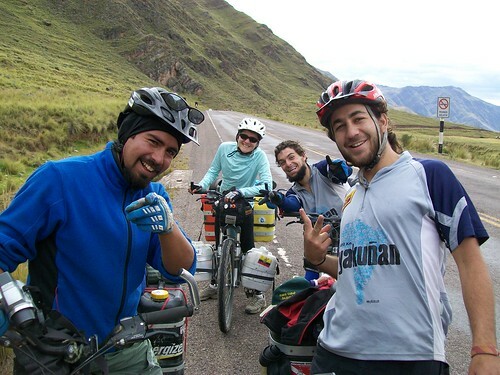 Coming the other way we met four Ecuadorian cyclists. Their trip will take them from Quito to Iguazu. Along the way they are visiting the most dramatic waterfalls. Especially of interest for me were their homemade panniers made from old barrels. Very tough, very waterproof and very cheap, but perhaps a bit heavy. 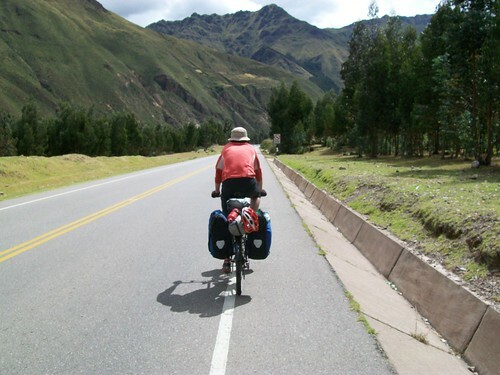 I am always impressed with the resourcefulness of South American cycle tourers. Basic mountain bikes, cobbled together racks but they are off and doing it! We turned up in Sicunai in the middle of a parade of school children, all in sports kit, blowing whistles as they were an army of tiny lunatic referees. Weird. We got a hospedaje and went out to get fried chicken and chips and be interrogated by a plastered Peruvian. "Where are you from?" he asked us. "No, England. In Europe," we persisted. "Ah," he seemed to comprehend. Then, as an afterthought, he asked, "Where are you from?" In the morning another parade. This time a mile long cacophony of those tuk-tuk type things, with balloons and decorations, all beeping their horns. More peacefully, our day's cycling took us through a valley of small villages with terracotta tiled roofs. The steep-sided mountains around us were lush green and here and there were signs that they were once terraced for agriculture. We had lunch in a cafe looking out on cobble streets and bell tower of a colonial church of the village plaza. Then we got ice-creams. Disappointingly, our downhill day was thwarted by a strong headwind. Nevertheless, we arrived in Urcos. 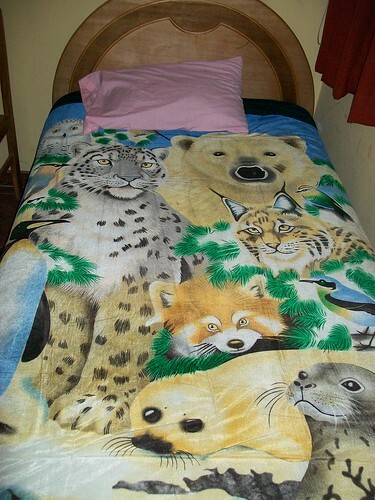 Particularly nice was a bedsheet depicting an owl, polar bear, fox, leopard, seal and penguin. In the plaza we found a nice place with chicken being roasted over an open fire for dinner. 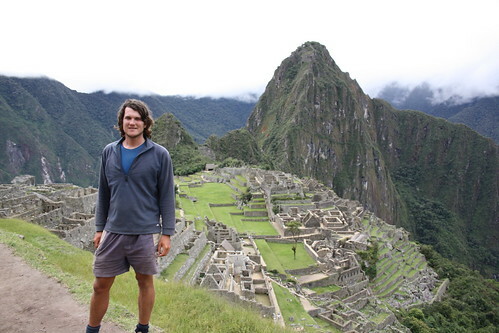 With only a short hop left to Cusco we climbed out of town. 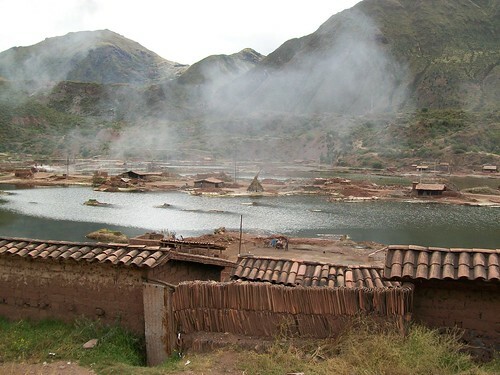 We passed several more typically Peruvian villages. There was a lake where some children were rolling out clay into a frame to make tiles. Black smoke rose from a shack that presumably was a kiln. Goodness knows what they burn. 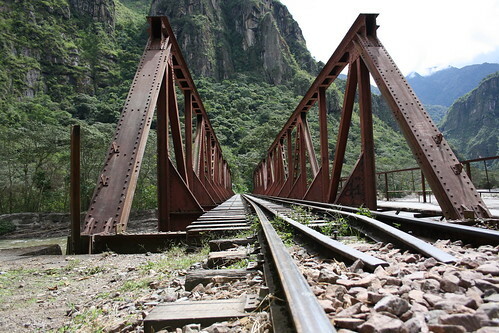 Later we passed a curious structure, perhaps dating back to Inca times. I think it was an aqueduct but it may also have been some kind of fortification as it was at a strategic location close to Cusco and at the top of a small pass. 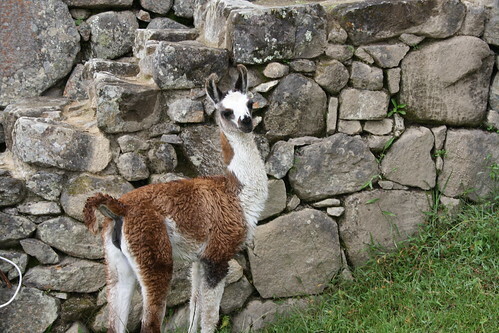 Cusco is a big city. 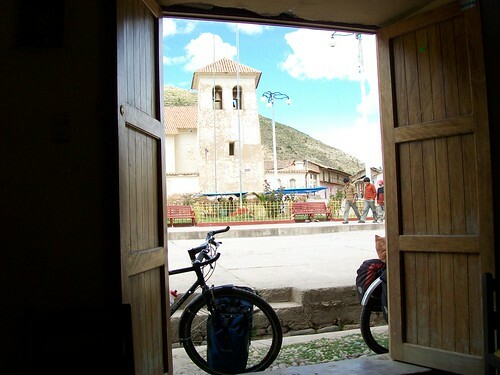 After passing the "Bienvenidos a Cusco" banner we still had another 40 minutes of cycling through suburbs and outskirts before we arrived in the historic centre. It started to drizzle. Pulling up in front of the cathedral we took photos in a brief respite in the rain and then went for a big pizza dinner. For a different take on the last few days, a lot of terrific photos, and a rude comment about my hair...take a look at Mike's post.